Living up to its name as the ‘City of Temples’, Bangkok, Thailand is dotted with amazing temples with unique and truly eye-catching architectural design. Representing the rich cultural and spiritual heritage of Thailand and its people, these magnificent structures are not only pleasant to behold but interesting to get to know as well. If you are traveling to Bangkok and wishing to see the wonders that it offers but has limited time, a visit through its Ancient City is the perfect activity for you! 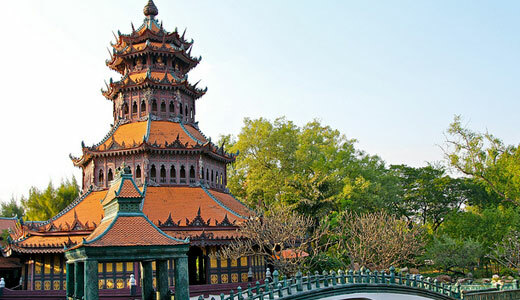 The Ancient City is a park and/or a museum set in a 320 acres of landscaped gardens that features replicas of Thailand’s historically significant structures, preserving its heritage, art, customs and culture. Notwithstanding the amazing parks and gardens, the temples and the architecture here are truly magnificent! 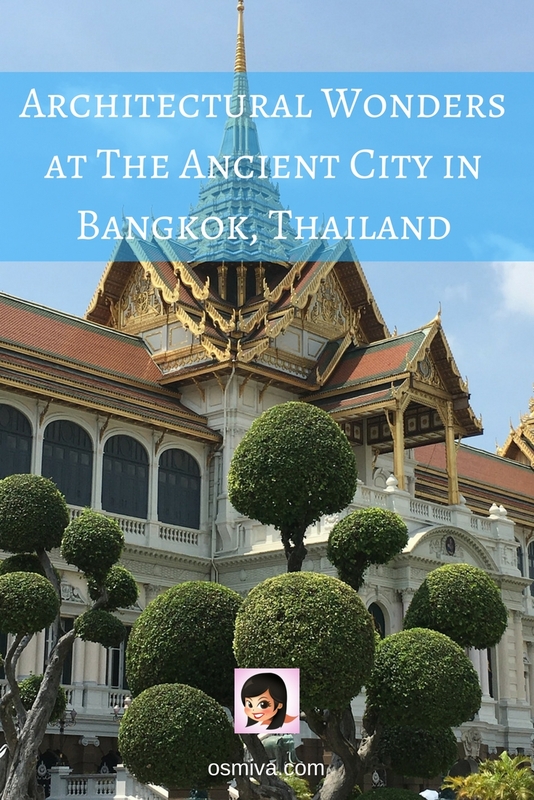 Browse through this Architectural Wonders at The Ancient City in Bangkok, Thailand and see what you might miss if you fail to visit this interesting and entertaining attraction!!! A gilded hall or golden pavilion, the Ho Kham was formerly used in as th official residence of the Royal Governor of the Lampang Province. The original house was pulled down about 30-50 years ago, but the replica at the Ancient City was modeled with the same structure of timber finely constructed in the northern style. 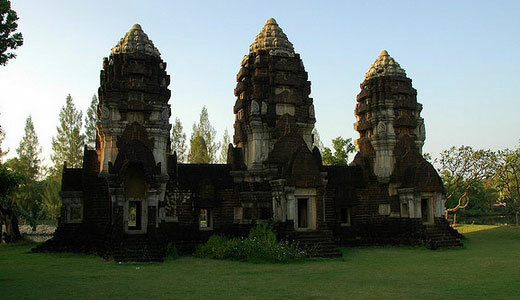 Prang Sam Yod, otherwise known as the Three Spired Sanctuary is originally located in the heart of Lop Buri Province. 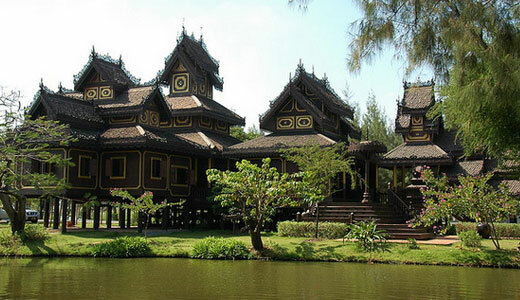 Made of laterite and shows the influence of Khmer art, the sanctuary is considered the art of the Lop Buri school. 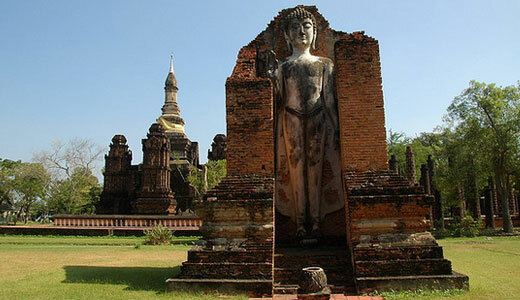 The Sanphet Prasat Palace was the principal palace in the early Ayutthaya period. The distinctive artistic style of the palace was later known as the Ayutthaya school with a tall cube rabbeted at each angle, and two wings adjacent to both sides of the central hall. The Palace was used in many important court and state ceremonies. 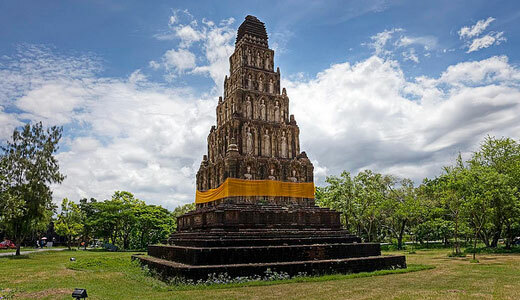 The Chedi is a square tower with 5 storeys and is formed like a stepped pyramid. Each storey has about 12 Buddha images on it. These statues are Dvaravati and U-Thong arts and date back to the 9th and 10th century A.D. 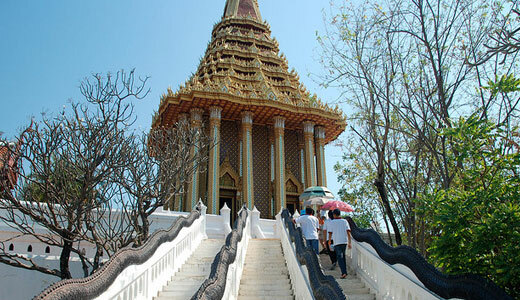 Regarded as one of the most sacred places of Thailand, the Footprint of the Lord Buddha was built on top of a hill in Saraburi Province. 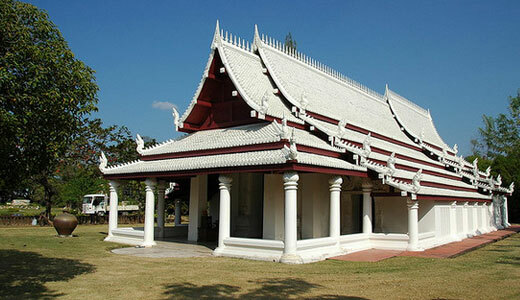 The building was designed in the Ayutthaya art. 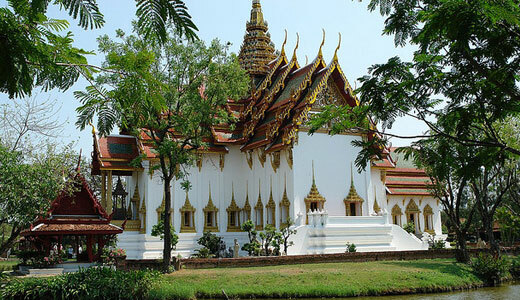 A cruciform build ing with large high roofs, the Dusit Maha Prasat Palace, also known as The Grand Palace, was built as an audience hall and was intended to be as large as the Suriyat Amarin Palace of Ayutthaya. 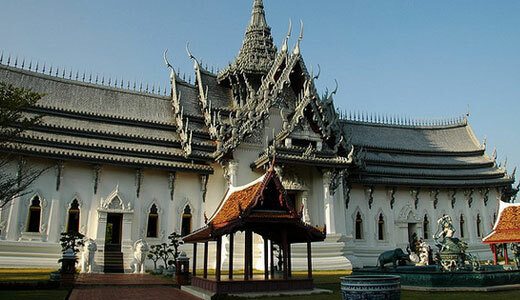 Today, the Grand Palace is the only remaining example of the traditional Thai palace. Located originally in Wat Maha That and joining the wihan luang or grand hall, the Main Chedi of Wat Maha That, Sukhothai is made of brick and laterite. Each side of the square base, is ornamented with stucco motifs of walking Buddha image with palms pressed together. The replica at the Ancient City was constructed by reducing its actual size by three-fourths. The Phra Kaew Pavilion is an octagonally-shaped structure with carvings on a wooden door panel of a scripture cabinet of the Ayutthaya period. The Pavilion has elaborately embellished and painted with murals depicting the story of the Life of the Buddha, Jataka and the Three Worlds. Reconstructed based on archaeological and historical evidences, the Sukhothai Wihan has ceramic roof ornaments with a Buddha image modeled after the Walking Buddha Image from the niche in the north face of the mondop at Wat Traphang Thong Lang in Sukhothai. 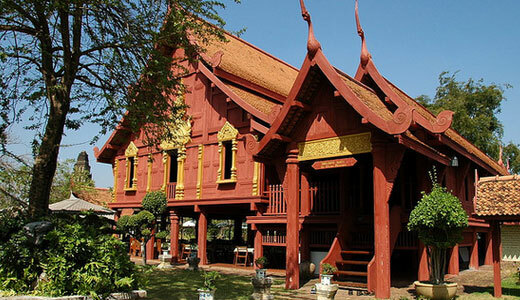 A Shan temple complex modeled after the Pagan architecture, the Wat Chong Kham, Lampang is made of teak wood, combines wihan, sala and monks living quarters in one building. More from Asia and its great attractions right here! 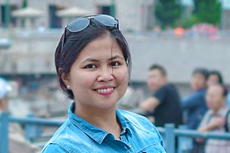 Shanghai, China; Phuket, Thailand; Palawan, Philippines and Singapore!